Blogger is the among the best CMS (Content Management System) that is being used globally. The primary feature on this platform is it is free associated with hosting meaning we must purchase domain only without having hosting in the event that domain is necessary otherwise we could also work with free sub-domain. Properly, when many of us create blog post, sometimes we have to upload data/files pertaining to public get or and this can be downloaded straight into blog reader’s program. But regrettably, there isn't any option to upload files that could be due to help free hosting and in addition for keeping away from people through uploading pointless, spam as well as malware files in servers. And so, sometimes persons get confused to upload data files. Don’t get worried, In this tutorial I am going to show you how to upload files to download in Blogger. 1. Go to Google Drive > Create > Folder and name the folder such as Blogger Uploads. 2. Open the folder which you created in first step. 3. Click on Upload Button and then click on Files button. 4. Now select the files which you want to upload in your blogger blog. 5. After file is uploaded,Right-click on it and click on Share button and then again click onShare button. 6. Now in Who Has Access change Shared Privately with Public On The Web and copy the Link To Share link on Notepad or any text processing software. 7. Just below the first link paste the following code in Notepad. 8. Now copy the File ID of first link and replace it with Your-File-ID in second link. 9. After that your Download link should look like below link. 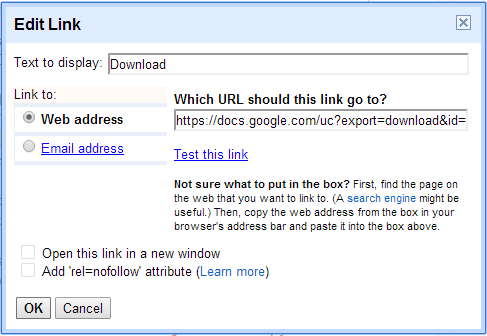 Paste The Prepared Link in URL Box, Write "Download" in "Texts to Display" Box. How to Embed Youtube Video in Background of Blogger Blog? Now you can use this download link in your blog while writing the posts.Their are many file sharing sites are available on internet but I recommend you to use Google Drive because it provides 15 GB of free storage to their users. Now It's your turn to share this post with your friends and write your views in comments till then Happy Uploading and Downloading! can I track traffic for downloads? Thank you! Hi, First of all thanks a lot for sharing this awesome trick, I have did it the same way you explain it but there is tow things to solve the first one is the download button or link is too small the second the image of the related software is not shown if you please this issue Thanks. Upload a download button png and add link to the download button image. That's it. You just solved a big problem for me, thank you. Fantastic you saved me a headache! Thanks. this is helpful sir ! can you add an mp3 to play online? Thanks for sharing this. But I tried using it , the link is failing. It's saying the post might have been deleted. Hi. I want to add downloadable file but the users need to sign in first or register. How? How do I collect emails before the visitors can download the file? How do I collect emails and payment before the visitors can download the file?